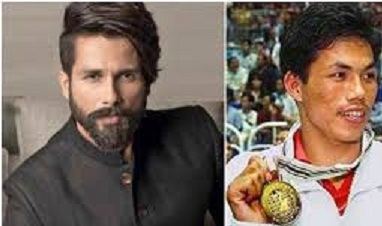 Netizens have not been able to “digest” the piece of news that Bollywood actor Shahid Kapoor is all set to bring the story of former boxing champion and Asian Games gold medalist Dingko Singh of Manipur alive on celluloid. A report appearing in INDIA TODAY stated that many are “unhappy” with the casting, and feel that an actor from the North East should have been roped in for Raja Krishna Menon’s film on the Manipuri boxing great. The report further stated that several netizens have taken to social media to express their disgruntlement at Bollywood’s tendency for “cultural appropriation”. Earlier, Priyanka Chopra was criticised for portraying five-time world champion and Olympic bronze medalist Mary Kom in the sporting legend’s biopic. To make Priyanka look more convincing as a Manipuri, Hollywood make-up artist Mark Garbarino was roped in. However, the makers opted for a special effects solution after they realised that prosthetics would not hold while filming heavy-duty boxing sequences. Meanwhile, Shahid is extremely excited to be playing Dingko Singh. “His life story is unbelievably crazy; it is very human and extremely inspiring. Such amazing stories of heroes need to be told,” the actor said. Ngangom Dingko Singh, known as Dingko Singh (from Manipur) was the first and only Asian gold medalist boxer from India in the Bantamweight category. In 2013, he was awarded the Padma Shri. Dingko has been an inspiration to many boxers who came into the ring after him, and he is so passionate about the sport, that he went on to become a coach for young boxers. In 2017, he had to battle cancer and he struggled to raise funds for his treatment. “In 2017, Gautam Gambhir became aware of his situation and sent money for his treatment. Soon, people found out who he was, and 13 doctors came forward to help him. He is a sports star who survived cancer. At some point in his past, he had almost become a Naxalite. His life story is unbelievably crazy; it is very human and extremely inspiring. Such amazing stories of heroes need to be told,” Shahid added. Currently, he is awaiting the release of Batti Gul Meter Chalu.